Oakland is in a housing affordability crisis of epic propotions. With Uber and other tech companies coming to Oakland, we can’t afford to fall short on building and preserving affordable homes. We need policy solutions now to make sure that Oakland grows equitably, with no displacement, and with the needs of the community at the forefront. This winter, the City of Oakland will finally be considering a Housing Impact Fee. A strong housing impact fee would require developers to pay their fair share towards affordable homes, and ensure that the City is healthy and inclusive community for generations to come. 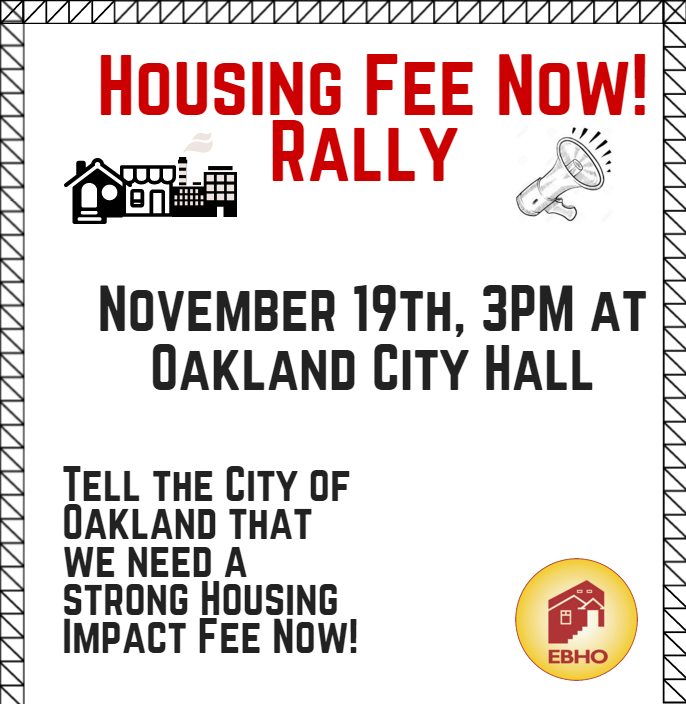 Join the Oakland Community Investments Alliance to tell our decisionmakers that we need a strong #HousingFeeNow! Read more about OCIA and housing impact fees here!